Memorial Pediatric Dentistry is your local Houston family dentist office. We treat young patients in a warm and welcoming environment. We welcome families, throughout Texas, to schedule an appointment and experience how we can keep their children in optimal oral health. David Tang, DDS, focuses on improving the overall experience of our patients, whenever possible. This means that the moment you walk into the Memorial Pediatric Dentistry, office, you will be greeted with a warm smile and welcomed by our friendly staff. We understand that visiting a new dentist can make children unsure about what they will experience. We work diligently so that our patients throughout Houston and the surrounding area enjoy their visit every time. To schedule your appointment, call 281-858-2135. If you reach us after hours or on the weekend, we will do our best to return your call as quickly as possible. David Tang, DDS, and the staff at Memorial Pediatric Dentistry, believe in the importance of preventative care. We focus on keeping patients throughout TX in good oral health so that they can live a full, healthy and enjoyable life, free from oral pain. This starts by educating our patients on what they can do to stay healthy at home. In our family dentist office, we recommend that patients eat a healthy diet consisting of green leafy vegetables, lean protein, nuts, dairy products and crunchy fruits. Eating these foods, along with drinking water, can keep teeth healthy and make them stronger. By simultaneously reducing sugar intake, patients throughout Houston can reduce their risk of cavities. It is also important for parents to have their children brush and floss throughout the day. Instead of waiting for bedtime to brush teeth, have your child carry a small toothbrush to use after meals and snacks. This makes it possible to remove sugar and bacteria, before it has the opportunity to turn into acid that attacks the teeth. This preventative step can greatly reduce a child's risk of getting a cavity or gum disease. David Tang, DDS understands the importance of taking these steps at home and will take the time to educate patients. Following the appointment, parents can continue to instill proper dental care in their child's daily routine. Education, after all, is essential for living a long and healthy life. We welcome patients throughout the Houston, TX, area to schedule an appointment with our family dentist office and call (281) 858-2135. Everyone should have their teeth cleaned and examined at least twice a year. If it has been more than six months since your child's last visit to the dentist, do not delay in scheduling an appointment. During these ongoing dental exams, David Tang, DDS, will make sure that your child's teeth are thoroughly cleaned. Along with a thorough cleaning, we will also look for any signs of cavities or gum disease. If any are found, they will be treated before they can spread and create additional problems. Early detection and treatment are important for reducing any pain that may come as a result of an infection. For example, if gum disease is caught early, it can be treated with a deep cleaning. If gum disease is left undiagnosed, surgery may eventually be required in order to correct it. 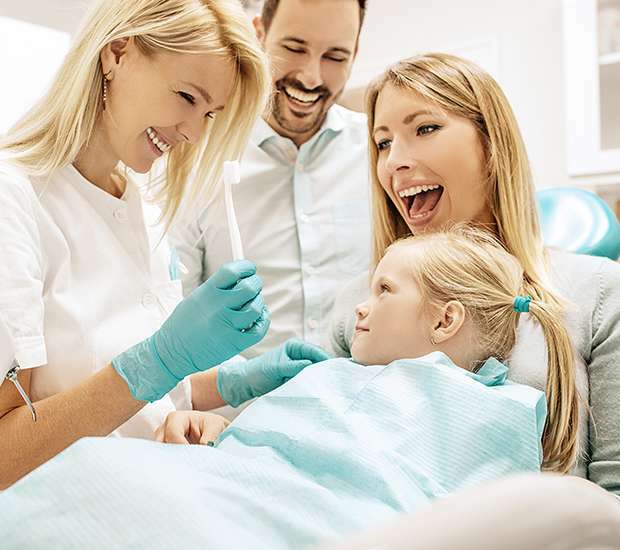 Understanding the importance of these regular dental exams, the staff at Memorial Pediatric Dentistry, works to make each patient extremely comfortable. This includes being welcoming and kind, while performing dental treatments in a way that is both painless and relaxing. Patients throughout Texas visit our dentist office because they trust us to do just that – take care of their teeth and gums, gently. While the majority of our patients are local and come from the Houston area, we see patients throughout the state that are looking for expert, gentle dental care. We mainly treat children and adolescents at Memorial Pediatric Dentistry. We understand that children require a different approach when it comes to dental care. For example, we keep children patients comfortable during visits, so they remain relaxed and form a willingness to come back. With children, we go as slowly as necessary to ensure that their appointments are pleasant. Additionally, we focus on keeping their teeth healthy and free from cavities. We take preventative measures in the form of additional treatments to strengthen and protect a child's teeth. David Tang, DDS, knows that it is far easier to keep a child's teeth healthy and free from cavities, than to try and get them comfortable with a major dental treatment. If you have children, call 281-858-2135 to schedule an appointment and help them stay in good oral health as they grow. A: Primary, or "baby," teeth are important for many reasons. Not only do they help children speak clearly and chew naturally, they also aid in forming a path that permanent teeth can follow when they are ready to come in. A: First, rinse the irritated area with warm salt water and place a cold compress on the face if it is swollen. Next, give the child acetaminophen for any pain he or she might be feeling. Placing aspirin on the teeth or gums will not be as effective. Finally, see a dentist as soon as possible. A: Dental sealants work by filling in the crevasses on the chewing surfaces of the teeth. This shuts out food particles that could get caught in the teeth, causing cavities. The application is fast, comfortable and can effectively protect teeth for many years. A: Have your family dentist evaluate the fluoride level of your child's primary source of drinking water. If your child is not getting enough fluoride internally through water (especially if the fluoride level is deficient or if your child drinks bottled water without fluoride), then we may prescribe fluoride supplements. A: Soft plastic mouthguards can be used to protect teeth, lips, cheeks and gums from sport related injuries. A custom-fitted mouth guard will protect your teeth from injuries and even provide protection from severe injuries to the head. If you live in the Houston area, call (281) 858-2135 to schedule your dental exam so that you can remain in good health or receive treatment for a current condition.